For medium to high efficiency filtration in heating, ventilation and air conditioning systems or as pre-filters for HEPA (Absolute) filters. The HE Multipocket range is designed to ensure long life between maintenance intervals and achieve a high level of cleanliness in offices, shopping centres, factories, etc. 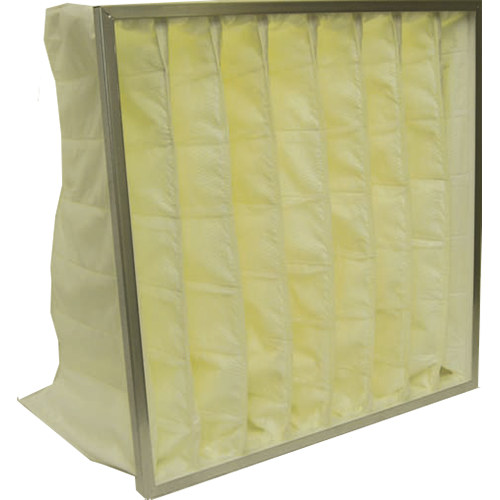 Made from 100% spun bonded Polypropylene synthetic media these bag filters are inherently Anti-microbial and resist microbial growth and any build up of moulds or mildews. As such they are particularly suitable for Hospitals and food production areas and all applications where micro-glass fibre is unacceptable. The HE Multipocket range is constructed from 100% spun bonded Polypropylene synthetic media with integral ultrasonically welded spacers, which have a high burst pressure.These spacers prevent over inflation of the pockets and provide uniform air distribution throughout the media, which reduces pressure differential. The pockets are retained in a rigid galvanised header frame ensuring maximum stability in all applications. Available in a wide range of standard sizes and grades, please contact us for full details.